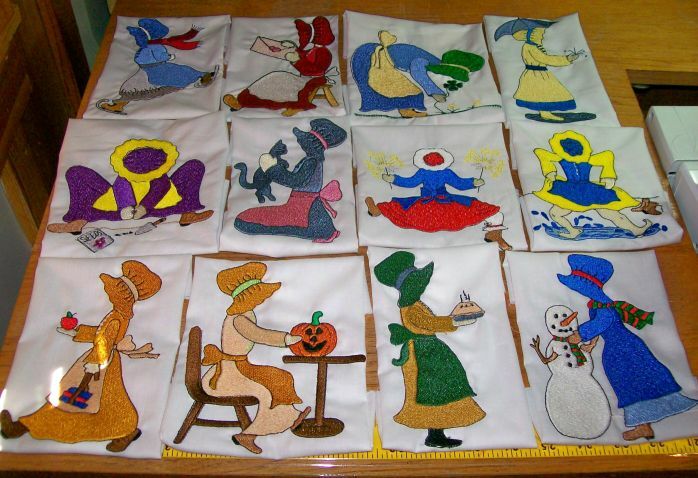 12 COUNTRY SUNBONNET SUE QUILT BLOCKS. EACH BLOCK IN THIS SET IS DIFFERENT WITH THE THEMES DONE FOR EACH MONTH. THESE DESIGNS ARE DONE IN EMBROIDERY. DESIGNS ARE A LARGE 5X7 DONE ON 10 INCH MUSLIN (BLEACHED OR UNBLEACH WHAT EVER I HAVE ON HAND). SHIPPING IS ADDED TO PRICE AT PAY PAL. S/H is added at pay pal.